Michael Hersch is an extraordinary composer. His chamber opera titled On the Threshold of Winter, which recently was presented in an astonishing production by the NOVA Chamber Music Series, makes as huge demands on audience members as it does on the soprano and the chamber orchestra that accompanied her. In the intimate setting of the Studio Theatre at the Rose Wagner Center for Performing Arts, Hersch’s opera puts performers and audience members in a closed space of remarkable imagery and music that commands us to consider, remember and meditate on the experiences and inevitability of our mortality. As confident and secure we are in our healthy lives, the mere apprehension of inevitable mortality for ourselves or loved ones makes us awkward, inarticulate, vulnerable, or unsure about what meaning to make out of the grimmest stages of suffering. Ah Young Hong, On The Threshold of Winter, Michael Hersch, NOVA Chamber Music Series. Photo Credit: Michael Maguire. In a performing arts genre that has been obsessed with death even as it has romanticized it to the point of paradoxical pop cultural appropriation, Hersch’s opera, a monodrama set for one singer, is an emancipating work. 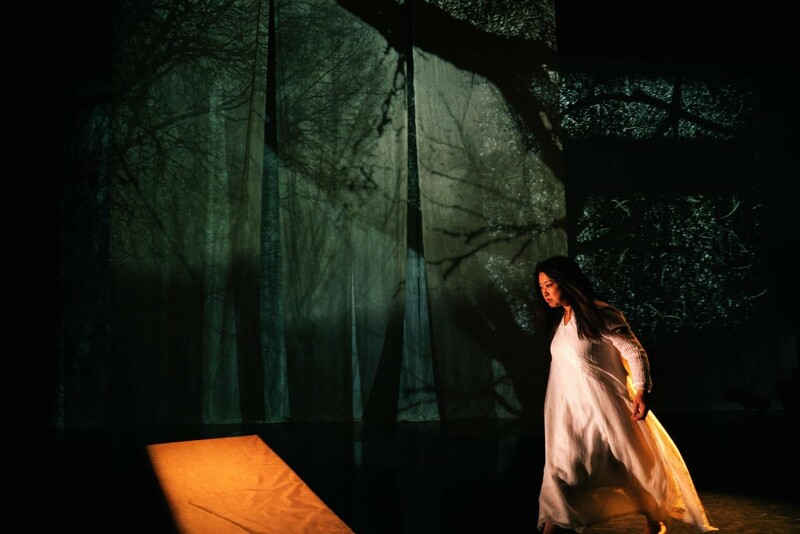 Soprano Ah Young Hong, the definitive performer for the opera, brings forth every bit of poetic impact from the libretto Hersch composed from the final set of poems that Marin Sorescu, a Romanian poet, satirist and playwright, wrote during the last five weeks of his life in 1996. It is a remarkable display of endurance for a two-hour work. Her vocal musicianship is a mastery of breath control and phrase articulation that amplifies the rhythmic textures of Sorescu’s original verses. The emphasis is not in soprano’s familiar domain of the higher register but on the darker, visceral textures in the lower ranges. Hong’s dramatic presence astounds at every turn. Meanwhile, Tito Muñoz, Phoenix Symphony’s music director, gives the opera’s score its organic dramatic arc and symmetry, matching the backdrop of videography created by Maxwell Bowman. The eight-piece orchestra, comprised of Utah musicians, included Caitlyn Valovick Moore, flute; Luca de la Florin, oboe; Jaren Hinckley, clarinet; Katie Porter, bass clarinet; Gavin Ryan, percussion; Michael Sheppard, piano; Hugh Palmer, violin and Walter Haman, cello. From the introduction, Hersch’s score throws down the gauntlet, challenging the performers in music that can be disjunctive, jagged, muscular angular and then suddenly fragile in brief but prominent moments of lyricism before returning to an agitated state. But, all of this is embedded in Hersch’s impeccable conscience. As mentioned previously in The Utah Review, the companionship Hersch finds in other art forms is integral to his composing approach. Ah Young Hong, On The Threshold of Winter, Michael Hersch, NOVA Chamber Music Series. He had discovered Sorescu’s poems that were published posthumously in The Bridge (Bloodaxe Books, 2004), translated by Adam J. Sorkin and Lidia Vianu, during coinciding events of personal significance. Hersch’s closest friend, who was in her thirties, was dying from cancer, while he was being cured for his cancer. Sorescu, known widely as a satirist who was nominated for a Nobel Prize in Literature, battled liver cancer and other conditions during the final weeks of his life, as he set these poems in a clear, courageous tone that characterized his life’s work. 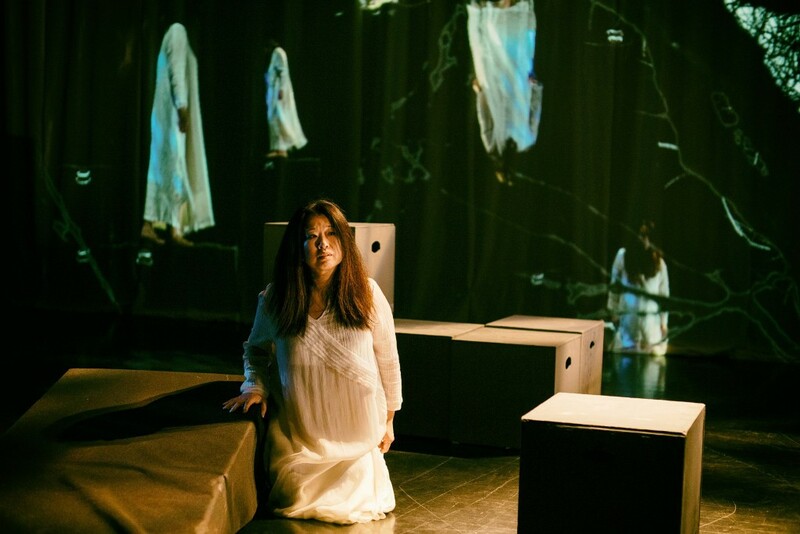 In Hersch’s hands and the artistic gifts of Hong’s voice, the music that carries the libretto crafted entirely of Sorescu’s words invites us to imagine how we might express ourselves in the face of imminent and inevitable mortality. These contemplations are difficult, especially when the language we hear often is framed as a battle or fight against cancer or any other form of disease. As one’s condition deteriorates, the individual already has lost many aspects of their lives that had made them so vital. Hong’s voice calls for the difficult acknowledgments, the uncompromising honesty we need at the threshold to sustain our individual humanity. Hersch brings it to an astute conclusion in a surprising way – using lines from a poem that Sorescu created in his last hours. The poem recounts how an old dog prepares to die, unable finally to muster the energy to show the unconditional affection and gratitude he always had done when food, water or toy was brought to him. Hong sings the poem’s final lines: “Terrible is the passage into the fold both for man and animal.” Then she turns around, clad in her white shroud and walks off the now-bare stage. The opera capped NOVA’s ambitious, successful American Visionary festival celebrating Hersch’s music. Crucible, Alwin Nikolais. Ririe-Woodbury Dance Company. Photo Credit: Stuart Ruckman. From the opening moments of Crucible (1985), it was assured that Ririe-Woodbury Dance Company’s program celebrating the works of the late choreographer Alwin Nikolais would be a certain audience pleaser. 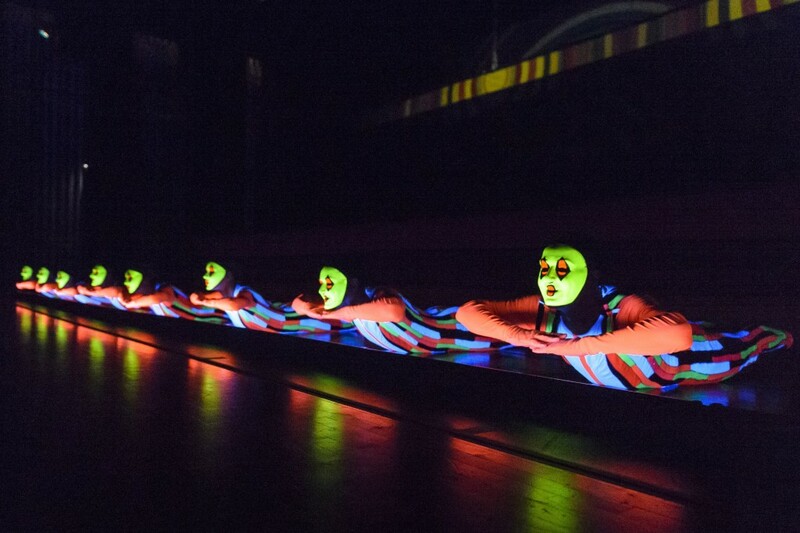 The work begins in near darkness as the brightly illuminated fingers from 10 dancers poke up over a shiny mirror plane placed on a slight incline. But, soon legs appear and then the bodies of the dancers rise, contort themselves and then fall below the plane, only to repeat the cycle but varying the movements and contortions each time. As mentioned previously in The Utah Review, Nikolas was seen as dance’s counterpart to the tech industry’s Steve Jobs. The effects and the music were all created, dictated and edited by the choreographer. Crucible turned out to be a mesmerizing opener and audience members in the Janet Quinney Lawson Capitol Theatre responded with audible delight throughout the performance. The work bursts into an amazing spectra of hues, tones and shapes but the most significant takeaway is how quickly one accepts the natural idea of the dancer’s reflections becoming part of the performers and our visual reception to the dual imagery of each performer on stage. In fact, Crucible was such a strong introduction to Nikolais’ work that it set a bar almost impossible to beat through the remainder of the program. Tensile Involvement, Alwin Nikolais. Ririe-Woodbury Dance Company. Photo Credit: Tori Duhaime. Almost as impactful was Tensile Involvement (1955), the earliest Nikolais work presented on the program. The dancers’ bodies appear initially in the most familiar way but they become increasingly distorted as the performers work with long streamers hanging from the ceiling and attached to the floor, spanning the wings of the stage. Nikolais’ work leverages every possibility from a straightforward prop. 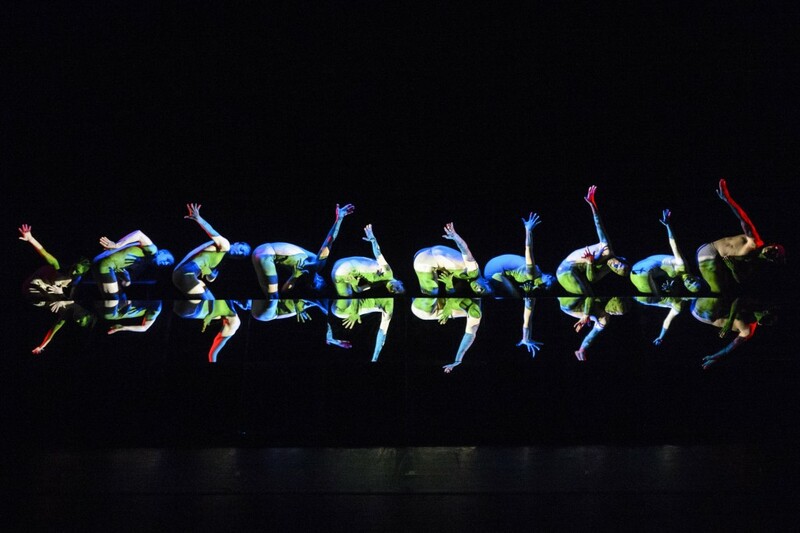 The dancers move seamlessly, creating cats’ cradles, rectangles that suggest they are standing in a doorway, or spider webs. The remaining two works were longer and encompassed various movements. Mechanical Organ (1980) is like an elaborate calliope with clockwork toy mechanisms – a pleasant curiosity and a solid study of design but lacking the inner momentum of the two shorter works that preceded it on the program. The work comprises two outer movements featuring the entire company with four inner sections showcasing solos or smaller ensembles. The most intriguing section was Mary Lyn Graves’ solo appearance in Doll With A Broken Head, who creates a convincing portrait of a self-amused mannequin. Mechanical Organ, Alwin Nikolais. Ririe-Woodbury Dance Company. Photo Credit: Stuart Ruckman. The concert closed with Gallery (1978), by far the darkest piece of the evening. It is like an old amusement park with a fun house as a central attraction. It is a pop culture piece with a mashup tone echoing an older Stephen King horror novel and the Simpsons’ Treehouse of Horror episodes. Nikolais creates a shooting gallery counter for the dancers clad in Day-Glo costumes. The most memorable section is the amusingly bizarre duet in pink costumes that make one nostalgic for the classic Dubble Bubble bubble gum. Strata was a good artistic breather for the company and its dancers in a season that is pushing contemporary dance into more complex story-telling expressions with deep philosophical underpinnings. There are no intimidating fears in approaching Nikolais’ work as an audience member. The performances provide lots of entertaining stimuli that emphasize the value of a clever imagination in designing a dance. As Daniel Charon, Ririe-Woodbury’s artistic director, noted previously, Nikolais’ choreography remains relevant for its fundamental impact in the art and design of contemporary dance. Now a quarter century after his death, the company has a unique role in preserving and reconstructing Nikolais’ work. And, it was an unexpected treat to have Alberto del Saz, a former Nikolais company dancer who has ensured that his mentor’s artistic legacy is sustained, on hand to step in and fill a performing role after one of the dancers injured his back during a preview show for Utah students. Gallery, Alwin Nikolais. Ririe-Woodbury Dance Company. Photo Credit: Stuart Ruckman. Last year, PYGmalion Productions presented Lauren Gunderson’s play Silent Sky, based on the life of Williamina Fleming, a maid who eventually became a pioneering astronomer at Harvard. The play recently has been among the most frequently staged works by a living American playwright. Another popular Gunderson play for productions is I and You, which is set entirely in the bedroom of Caroline, a teenager who has a serious illness and is unable to attend school. Enter Anthony, a high school basketball player who visits Caroline to work on a presentation about Walt Whitman’s Leaves of Grass. The story appears straightforward enough as a pair of dissimilar individuals working on a routine school project begin to discover more about each other. There are well-placed hints throughout the play that foreshadow the ultimate mystery of why these two become connected to each other but Gunderson also effectively layers the narrative with other themes that touch poignantly on the all-too-familiar awkward feelings, paradoxes and frustrations of teen life. Tristan Johnson, Cora Fossen, I And You, Lauren Gunderson, PYGmalion Productions. 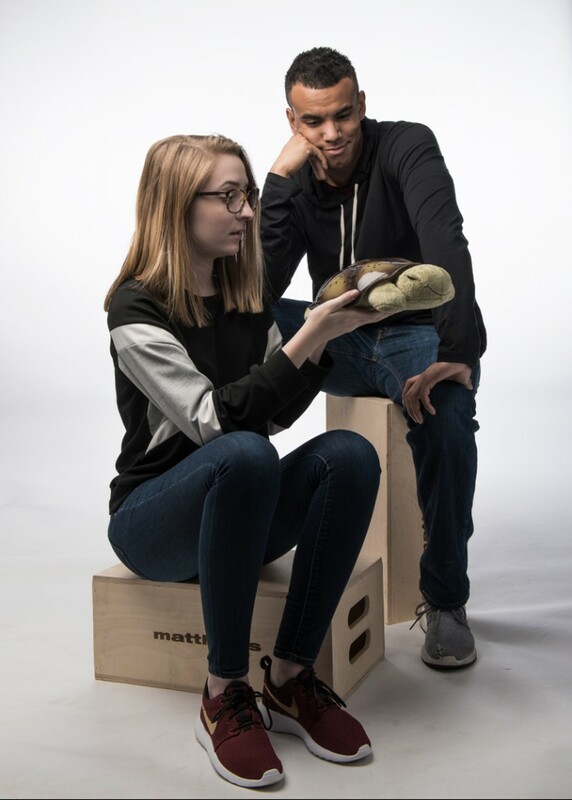 PYGmalion Productions offers a sensitive, warmhearted, well-acted interpretation of I and You, in a production directed by veteran actor Teresa Sanderson and featuring two relative newcomers to the stage – Cora Fossen (Caroline) and Tristan B. Johnson (Anthony). Fossen, 18, is finishing high school before she begins her studies in theater later this year at Westminster College. She is the daughter of Mark and April Fossen, who are among the most visible figures on the local theatrical scene with many exceptional performances in their respective portfolios. Johnson, a junior in theatrical performance at Westminster College, is in his debut with the company. Gunderson possesses a more compelling touch of sentimentality in reaching audiences with characters who are more rounded and complex than, say, in a John Green novel including his best-selling The Fault in Our Stars. I and You earned Gunderson the American Theatre Critics Association’s New Play Award in 2014. While there were some opening night jitters and some tentative pacing, Fossen and Johnson build a wonderful ensemble of chemistry on stage. By the play’s final third, the dynamics are electrified in a growing sense of genuine affection that riffs credibly off the impetus of Whitman’s classic verse. Fossen finds the right instincts in some of her best one-liners. Johnson’s presence on the stage grows continuously throughout the narrative and he strikes an unexpectedly emotional impact at the most critical revelation of the play. 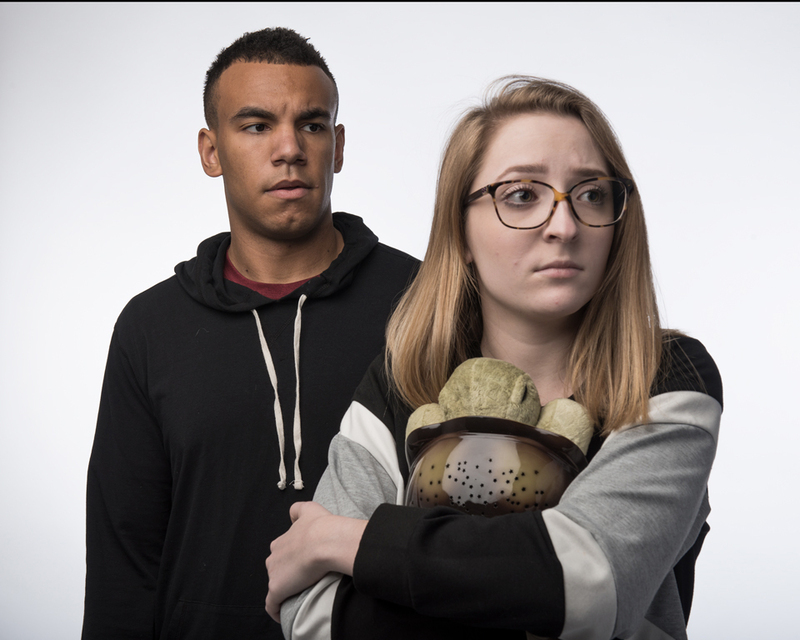 The play’s run continues through Feb.17, with performances on Thursdays, Fridays and Saturdays at 7:30 p.m., Sunday at 2 p.m., and an extra matinee Feb. 17 at 2 p.m. All shows are in the Black Box Theatre of the Rose Wagner Performing Arts Center. For ticket information, see ArtTix.